So you’ve gotten a horse and now you need a trainer? You know finding the right trainer will depend on your goals with your horse. Do you plan on competing or are you just wanting a horse to go trail riding on? Make sure you spend the time it takes and do your research because a good trainer can be hard to find. If you want to show look at the horse shows – Find out who the trainers are at the show. Now don’t approach a trainer right away instead sit back and observe them to see how they handle the horses. Make sure you watch them after they leave the arena and see how they handle the horse when they think no one is watching. You’ll also want to observe how they work with their students or clients. You could also ask their current clients what they think of the trainer, but keep in mind if their still with that trainer you’re probably not going to hear anything negative. If possible observe them at two or three shows before making an appointment with them. Be sure you visit the trainers facility before sending your horse to them. When you visit the trainers facility don’t discount them if they don’t have a fancy facility. Now it needs to be safe and clean, but fancy doesn’t make them a good horse trainer. I’ve seen trainers with fancy barns and they treated the horses and their clients horrible. So when you visit be sure to pay attention to the other horses they have in training do they pin their ears or try to bite at you when you walk by? Do the horses seem to enjoy the training sessions? came back very skinny and they didn’t get the training that was promised. I don’t want this to happen to your horse so please make sure you do your research, ask lots of questions and get references! Also be sure to ask if you can watch a training session. If the trainer won’t allow you to watch a lesson then find another trainer because they probably have something to hide. Do they promise to have your horse doing all kinds of advanced movements in 30 days? If so, you need to be very cautious because pushing a horse can cause lots of behavior problems. Make sure you ask the trainer if they are the only one that will work with your horse or will they have an assistant work with them. If they have an assistant who is also going to work with your horse then you’ll want to meet and observe them working with a horse. Another thing that is beneficial is keeping a written record and/or video tape the training sessions. You won’t find a lot of trainers who video tape the training sessions though, but you can still ask if they do. Make sure you get a contract for you and your horse’s protection. Be sure you get all of your questions answered and you feel confident in the trainer before signing the contract. Having a good client-horse trainer relationship is very important. 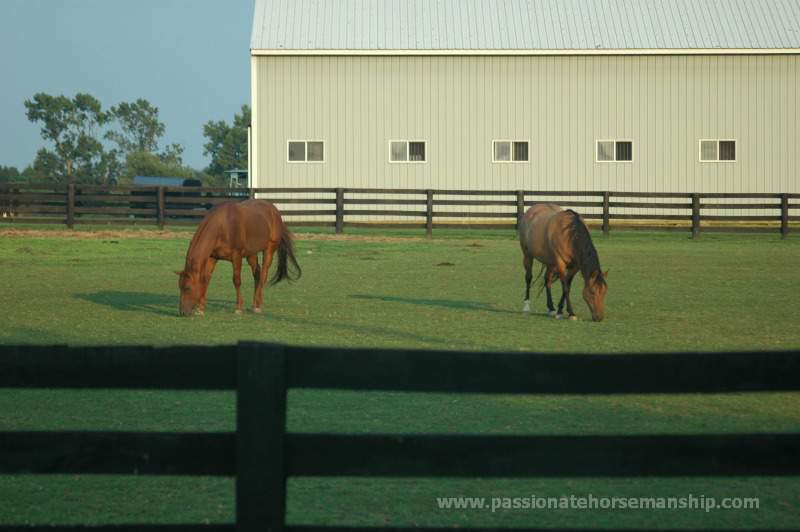 You want to feel comfortable and you want your horse treated well and trained properly. Keep in mind that honest hard-working trainers can be hard to find, but they can be found and when you find them they are worth paying their price. Really good trainers usually charge more than their competition because they’ll get you the results you want and will treat your horse very well. Just remember you get what you pay for! If the trainer doesn’t have room to take your horse in for training then ask if they have a waiting list or you could also ask them who they recommend. If you take them up on the recommendation go through this process again that I’ve outlined above because things change with people. Another option is to find a trainer who will teach you how to work with your horse and that’s what I do so you’ll know exactly what to do with your horse when you get home. Trainers can get your horse to do all kinds of things, but if they don’t teach you then you won’t get the same results!